Saddle Ranch Chop House, the iconic ranch-style restaurant originally founded on L.A.'s Sunset Strip, has migrated to Orange County. Located on the top floor of the Costa Mesa multi-level entertainment complex The Triangle, the restaurant features a Wild West-inspired ambience highlighted by the presence of a mechanical bull. The venue serves up food and cocktails that tap into the venue's rustic ambience, from steaks and chops to fish and barbecue ribs and Red Bull vodkas. For more information, visit www.thesaddleranch.com. Dinner nightly. Saddle Ranch Chop House, The Triangle, 1870 Harbor Blvd., Costa Mesa, CA 92627, 949-287-4652. El Corazon de Costa Mesa has opened in the rebranded, multi-level entertainment complex The Triangle. Executive chef Armando Martinez, who studied under Mexican cuisine impresario Rick Bayless and previously served as executive chef at Bayless' Red O in Los Angeles, serves up an array of coastally inspired cuisine from ceviches to kicked-up street food like short rib burritos. The venue also offers a host of margaritas, tequila flights and Mexican coffee prepared tableside. For more information, please visit www.elcorazoncocina.com. Lunch & Dinner daily. 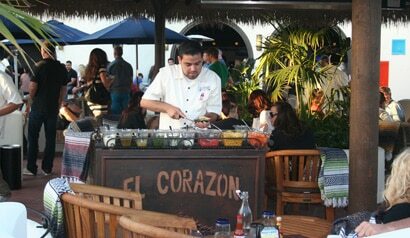 El Corazon de Costa Mesa, The Triangle, 1870 Harbor Blvd., Costa Mesa, CA 92627, 949-612-2349. The restaurant Microbar has opened in Ladera Ranch. The eatery, festooned in a white and dark brown color scheme with Art Deco accents, features an exhibition kitchen where chef Brad Robinson creates small plates based on seasonality and ingredient freshness. Select dishes include burrata with roasted tomatoes with balsamic reduction, olive oil and basil; pan-fried oysters with a Cajun remoulade; and bone marrow with crostini, sea salt and roasted garlic. Dinner nightly, Lunch Sat.-Sun. 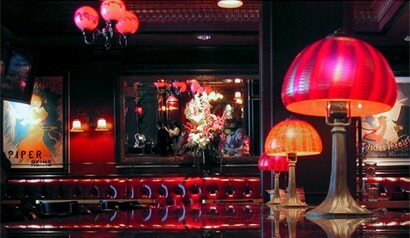 Microbar, 25612 Crown Valley Pkwy., Mission Viejo, CA 92694, 949-429-3380. Cathy Pavlos, owner and executive chef of Lucca Café in Irvine, has announced plans for a new culinary concept in Newport Beach called Provenance. Slated to open in the fall, the restaurant will take over the former location of Sage in the Eastbluff Village Center, which closed at the end of 2012. The new eatery will feature seasonal contemporary fare highlighted by ingredients cultivated from the venue's 1,300-square-foot, organic garden. Provenance, Eastbluff Village Center, 2531 Eastbluff Drive, Newport Beach, CA 92660, no phone. Brasserie Pascal in Newport Beach's Fashion Island features a Sunset Menu --- a special selection of cost-saving dinner and drink specials. Offered between 4 p.m.-6 p.m. Sunday through Friday evenings, guests can indulge in either grilled salmon served over a bed of basil-pesto risotto or grilled filet mignon served over Gruyère potatoes au gratin and accompanied with asparagus for $13. Additionally, guests can also enjoy a host of wine and cocktail selections ranging from $5-$7. For more information, please visit www.brasseriepascal.net. Brasserie Pascal, Fashion Island, 327 Newport Center Dr., Newport Beach, CA 92660, 949-640-2700. SideDoor, the gastropub attached the legendary Five Crowns restaurant, features Sunday Sessions, their lively, eclectic take on the traditional Sunday brunch. From 11 a.m.-3:30 p.m., the Corona Del Mar venue features innovative contemporary items like confit duck drumettes and a "green eggs and ham" version of eggs Benedict, DJ's spinning music, art being created in real time, and limited-release craft beers. For more information, please visit www.sidedoorcdm.com. SideDoor, Five Crowns, 3801 E. Coast Hwy., Corona Del Mar, CA 92625, 949-717-4322.